Fuses are glass resistors that provide overcurrent protection to your home’s electrical systems. Like their modern breaker counterparts, fuses complete electrical circuits and guard against electrical overloads. If too much current is drawn through a particular circuit, the fuse will blow and disconnect the power. Unlike modern breakers, fuses cannot be reset. Instead, overloaded fuses must be unscrewed and replaced. Fuses are housed in a fuse box. Fuse boxes are usually located away from main living areas. Garages, laundry rooms, and basements are common places for fuse boxes. If you’re unsure whether you have a fuse or breaker box, locate the panel and open it up. Breakers are rectangular units with on-off toggles. Most breakers are located in banks or rows. Fuses are small glass tubes with metal ends. How you address a blown circuit will vary based on whether you have fuses or breakers. The most common sign of a blown fuse is a power outage in one or more areas of your home. Fuses, unlike breakers, do not have on-off switches. Instead, most fuses have a small glass window that allows you to examine the fuse itself. Look for the blown fuse and unscrew the unit. Be sure to replace your fuse with the correct size. Most fuse boxes don’t have a safeguard against installing the wrong fuse. Installing an under-powered fuse will result in constant overloading. Likewise, an overpowered fuse will allow too much current to flow through a particular circuit. In extreme cases, this can damage your wiring and even cause fires. Edison Base (Type-T) fuses. Type-T fuses are designed to handle no more than 125 volts and have an ampere rating of no more than 30 amps. Edison Base fuses are only suitable for installations in which there is no sign of tampering or over fusing. Over fusing means installing a fuse that accepts a higher amount of electricity than the circuit can handle. In most cases, this will result in regular overloads. But, in extreme situations, the long-term use of an overpowered fuse can cause fires and permanent damage to your home’s electrical systems. Type-S fuses. Type-S fuses consist of two components: an adapter and the fuse itself. Each level of amperage has a matching socket adapter with a different threading to prevent mismatching fuses. Main fuses. Many fuse boxes have a main fuse. These are usually located above the individual fuses and housed in plastic casings. Pulling this fuse will interrupt power to your entire house. Main fuses are self-contained and hold two canister-style fuses. The size of the fuse is determined by its voltage or amperage. Be sure you know which size works for your fuse box before installing a new fuse. Step 1. Turn off your power. Pull the main fuse in your fuse box to cut power to the box. Some fuse boxes have two main fuses: Pull all the main fuses if you have more than one. Step 2. Locate the blown fuse. Older homes weren’t designed to handle modern electrical loads, so most fuse boxes house several fuses. All fuses have a glass top that allows you to see the fuse itself. Use a flashlight to locate the blown fuse. Similar to a lightbulb, a blown fuse will have a broken and charred filament or circuit. Step 3. Remove the fuse. Unscrew the blown fuse and install the replacement. Step 4. Turn on the power. Replace the main fuses to restore power to your home. If you have a fuse box, it’s a good idea to consider a replacement. Fuse boxes aren’t designed to handle the electrical needs of modern homes. As a result, most homeowners experience regularly blown fuses. Also, fuse boxes don’t have the safety features of modern breaker boxes. Over fusing is a common issue with older fuse boxes and one that can threaten the safety of your home and family. 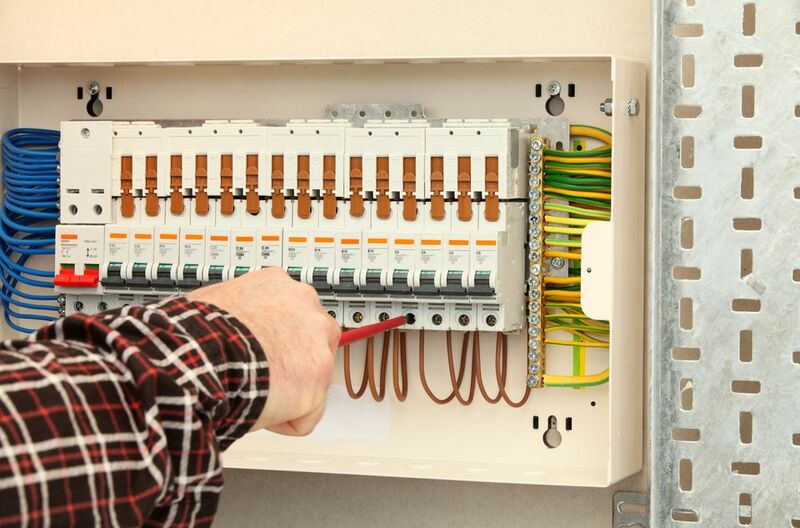 Always hire a professional electrician to handle a breaker box installation. Working with electrical systems is dangerous without the proper training and experience. Why Is There a Light Switch Next to My Furnace?